The film revolves around Miyo, the leader of a group of bullies, who are picking on another girl Maria. When a new girl Mika joins the class and becomes the new class leader and targets Miyo, Miyo realises the error of her ways and attempts to stop the cycle of bullying. Having solved bullying once and for al at their schooll, Miyo is presented with another dilemma. After catching her teacher stealing from a convenience store she becomes targeted by her own class teacher. This film is one of the worst I have ever seen. Ridiculous story and amateurish direction mean there is almost no tension throughout. The conflict established in the opening scenes is solved by the halfway point meaning the film feels like two short stories welded together. The solution to their problems can be worked out by the audience a long time before the characters realise the best course of action. Add to this the increasingly unbelievable scenarios, glaring plot holes and illogical actions and reactions and you have this disaster of a film. The acting is as patchy as the story and adds to the feeling of watching a poorly scripted television drama. This could have been good as the problem of bullying is a serious one, but the film underplays the severity of it to such a degree you feel no sympathy for characters and little understanding of the problem beyond clichéd back stories. The only reason you might watch this film is to see how not to write a compelling drama. The moral is that bullying is bad, something which doesn’t require a film to propound and heavy-handed, inept storytelling such as this does nothing to warrant it’s tackling such a subject. 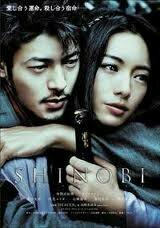 Based on the novel by Maki Ushida. 1614, Japan. At a waterfall a young man and woman from rival warrior tribes, known as “Shinobi”, meet for the first time and fall in love. The Emperor, Ieyasu Tokugawa, has summoned the heads of the two tribes to his castle. Promising them sanctuary and a place beside him in the castle he decrees that their tribes must fight to the death. The two leaders return and select five fighters each. The two young lovers are both chosen to fight. A forbidden love story reminiscent of traditional theatre the film begins with great swooping shots of the landscape and throughout looks fantastic with it’s highly stylised cinematography, set-design and costumes. Once the fighting begins the film is littered with slow-motion and CG which detracts a little from the story and makes it feel more like a video game adaptation. This is heightened by the fact each character has a special ability and multiple gravity- and logic-defying stunts put this firmly in the fantasy genre. However, towards the end the film has a couple of powerful scenes and the acting is good. The story maintains the focus largely on the two leads, although other characters are brought on briefly as foils or to fight. Their story is moving, particularly in it’s resolution and in the exploration of love and loyalty. If you don’t go in expecting a realistic drama you might enjoy the camp action scenes and anime sensibilities of this film.